Citing assembly elections in Karnataka, which are due on May 12, Centre has moved the Supreme Court on the Cauvery river water dispute. The protesters wanted the Centre to immediately set up the Cauvery Water Management Board. Chennai: Hundreds of people on Saturday gathered at the Marina beach in Chennai and staged a flash protest urging the Centre to immediately set up the Cauvery Water Management Board in compliance with a February 16 Supreme Court order on the decades-old river water-sharing dispute. The scene at the beach was reminiscent of the pro-jallikattu demonstrations at the same place last year. TV channels beamed images of men and women carrying banners and raising slogans against the Union government for not constituting the Board. Some social media platforms also streamed the protest 'live'. The protesters wanted the Centre to immediately set up the Board, saying farmers were already hit and their prospects could be affected further. The police later removed the protesters from the beach. A senior police official said protests should be held in Chennai only at designated places after obtaining necessary approvals. TS Anbu, deputy commissioner (Chennai East) warned the protesters for staging the demonstration without permission. "There are designated places in the city and police have notified those places. Protests should be held there after obtaining permission. If the general public is affected by protests, police will take action," he told reporters. He said the number of protesters picked up today was yet to be ascertained. 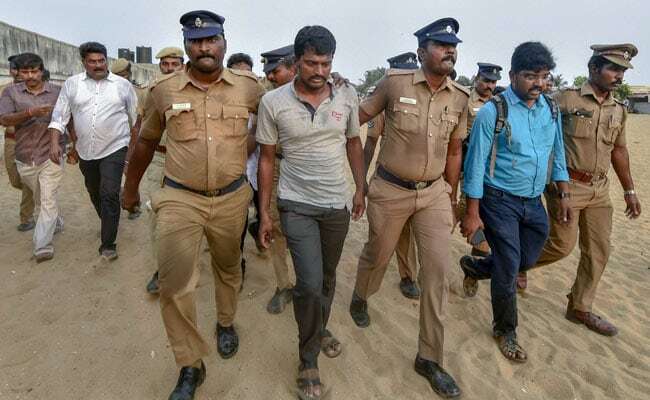 Ever since the massive pro-jallikattu protests that rocked the Marina for more than a week last year, the popular beach has been kept out of bounds by police for any kind of agitation. The police department has also been issuing frequent prohibitory orders, banning any kind of congregation. The jallikattu protests had ended violently following clashes between the police and the protesters, even as a bill was adopted by the state Assembly to amend the Prevention of Cruelty to Animals Act, 1960, to ensure conduct of the bull-taming sport. Tamil Nadu has been witnessing protests over the Cauvery issue of late, especially after the Supreme Court in its verdict on February 16 set a six-week window to evolve a scheme to solve the vexed inter-state dispute. It had granted six weeks time to the Centre to formulate a scheme to ensure compliance of its 465-page judgement, which modified the Cauvery Water Dispute Tribunal award. In its judgment, the apex court had raised the 270 tmcft share of Karnataka by 14.75 tmcft and reduced Tamil Nadu's share of Cauvery water. Following the verdict, Tamil Nadu has been urging the Centre to set up the CWMB and the Cauvery Water Regulatory Committee (CWRC) to ensure it receive its due share of water from the inter-state river.